VELCRO® brand fastening systems… the solution to your fastening problems! Use VELCRO® brand fasteners for displays, posters, signs, cable management, etc. around the home or the office. One Wrap® Straps are a unique back-to-back fastening system featuring a polyethylene hook laminated to a nylon loop. Re-usable and infinitely adjustable. Performs like a strap because one side adheres to the other – hook and loop are in one piece. 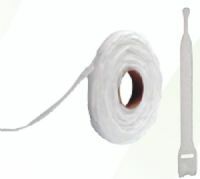 Ideal for bundling cables, tubes, rolls and leads.